The Queen Mary Breakfast Program is a free program available to all of the close to 400 students who attend the school. The program, which has been running for more than 10 years now and continues to evolve, provides nutritious foods to students right in their classrooms. The program's motto: By having full tummies, kids’ minds are engaged in the classroom, making the most of their time there. For a number of reasons, many children come to school not having eaten. Some of it is economics—like running out of food at home—but there are other reasons. Some have an early morning sporting event, some have long bus rides to school, others just don’t wake up in time to eat breakfast. Whatever the case, having food available to all the kids in the classroom removes the stigma associated with needing food. It also gives the teachers a valuable tool to keep kids focused on their work in the classroom. 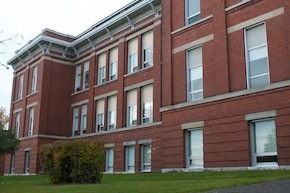 The program's success is due to three factors: The hard working volunteers (parents, grandparents, students and community members); the generous funding they receive, both from the funding they apply for and the support of Parent Council Funds; and the support they get from the teachers and staff at Queen Mary. Recently, the school's program coordinator, Chantal VanParys, took PtboCanada behind the scenes to show us how the breakfast program works. These photos and notes tell the story of how many hard working volunteers it takes to keep amazing programs like this running at schools. -We start the day unloading groceries. Our kitchen volunteers prepare the food and put it into Tupperware containers to be distributed to classes the following day. Each day, all classes receive food from three food groups: fresh fruits or veggies, grain products (muffins, granola bars, etc. ), and dairy (cheese or yogurt). -As the program coordinator, I set the weekly menu based on what is seasonally available, or on sale at local grocery stores. -This morning is busy, with volunteers who bake at home delivering freshly baked mini-muffins and banana bread, which are some of the staples of the program. Our kitchen is at the back of the Queen Mary gym, and was re-done this summer with the help of parent council, extra funding, and the support of our principal and school board. Former Queen Mary students take note: our kitchen used to be the girls’ change-room! 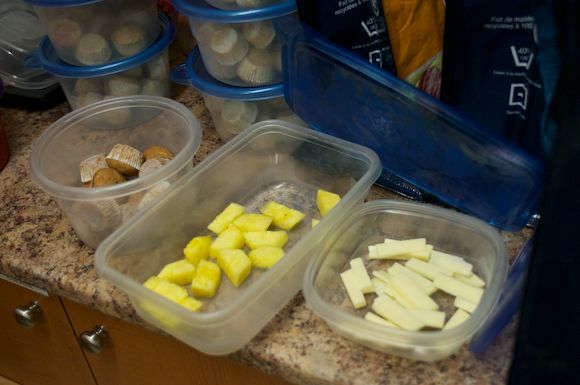 -Today, we are sending out pineapple, mini-muffins, and cut up cheddar cheese. Our volunteers come into the kitchen and load a reusable shopping bag with the prepared food for each class. -Right after the morning bell, students from each class come down to the gym to take the bags to their classroom. Some classes serve the food as a snack and the children eat together, while in others the food is available for children to access throughout the day when they need it. -Here we are preparing grapes, banana bread, and cheese for tomorrow’s classes. 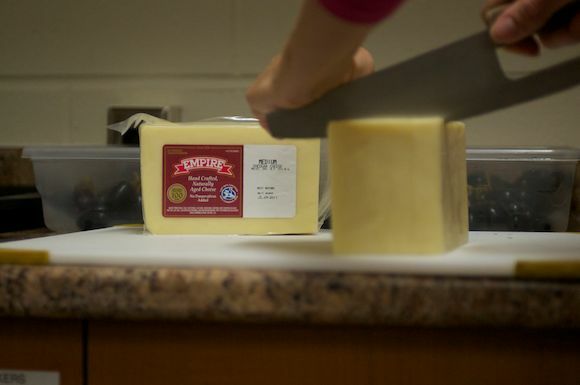 We prepare over 1 kg of cheese a day, delivered to us from local producer Empire Cheese Company. -In addition to the funding we receive from the Ministry of Children and Youth Service, Food for Kids, and Breakfast for Learning, we also get lots of support from local businesses, parents and community members. -We access Quaker Oats products through their generous donations to the Kawartha Food Share. Their peanut-free granola bars are a kid favourite. We also purchase Quaker Oats muffin mix at local grocers and provide it to our bakers. -Washing dishes is a part of the volunteer duties. We send out three or more Tupperware containers to 17 classes each day. Due to the volume and health regulations, dishes have to be hand-washed, rinsed in hot water, rinsed in a food preparation chemical, and then allowed to air dry. Swish, another local supplier, helps us to use as many green products as possible in our cleaning process. This process has been made easy with our new triple sink. -We recycle at the program, and all of our green waste goes to good use. We prepare almost 20 lbs of oranges, or more than 8 pineapples, or maybe 5 lbs of carrots and 16 peppers on any given day. Our green waste mostly goes to the school composter and is used in our award-winning garden. Some of our volunteers take green waste to feed pet bunnies. We also have had teachers take green scraps to their farms for pigs or horses. -Whole fruit and granola bars are always available in our school office for those who have additional needs during the day. -Tomorrow, a whole new set of volunteers start the process over again. Volunteers for breakfast programs shop, bake, prepare food, and do dishes all to help young minds grow! There are many such programs running in the Peterborough area. If you or someone you know would like to volunteer at a breakfast program near you, please contact Chris McCarthy, the Food for Kids Student Nutrition Program Coordinator, at (705) 742-2269 or cmccarthy.snp@live.com. If you have any questions regarding the Queen Mary Public School Breakfast program, please contact program coordinator Chantal VanParys at chantal.vanparys@sympatico.ca.